Have you ever had one of those moments where you felt completely inadequate? Well, today was such a day for me. 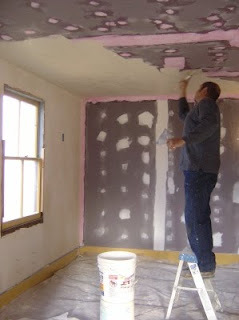 Jack came over, as promised, at 8am to help plaster the ceiling in the Stube. 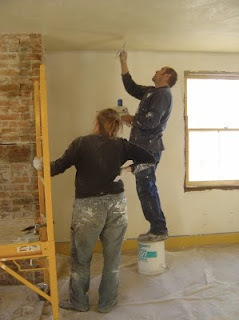 Only 45 minutes into the job, he had already started on his third bucket of plaster, and E! 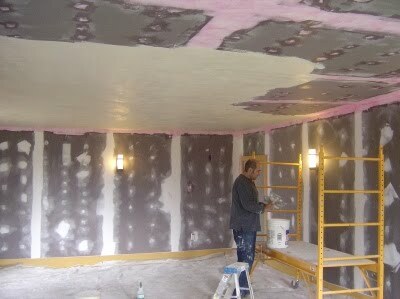 was rotating to keep up with him, while I was finishing applying plaster weld to the taped up areas on the ceiling. By maybe 10:30am Jack had covered almost half the ceiling in plaster already, that's when I jumped in. Crawling in might be more correct (see the little area in the lower right hand corner of the ceiling, that was my handy work), and Jack had to touch up quite a bit. After eight hours the ceiling looked spectacular, and Jack had given it that sheen that we so like in plaster. It was a frustrating day for me, because I felt completely out of place. On the positive side, I learned a lot simply by watching Jack work, and I am determined to hone my skills to be a better help next time, because we'll have Jack back for more work.